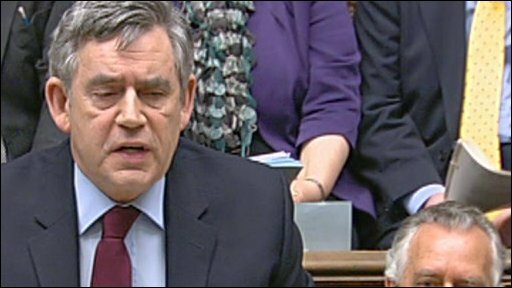 David Cameron: "He can't hide from the facts"
Gordon Brown "misled" the Iraq inquiry by wrongly claiming defence spending had increased every year under Labour, Tory leader David Cameron has said. The prime minister told MPs earlier that it had actually not risen "in real terms" in "one or two years". He has written to the inquiry's chairman, Sir John Chilcot, clarifying the situation. Mr Cameron told the BBC that the prime minister had been "wrong" to "cut" defence spending with the UK at war. Mr Brown appeared before the inquiry on 5 March and denied starving UK armed forces of equipment when he was chancellor. But his evidence has been criticised by former defence chiefs. Mr Brown told the inquiry that the defence budget was "rising in real terms every year" - but House of Commons library figures showed this was not the case. A research note prepared last October showed defence spending had fallen in real terms in four years - 1997/8, 1999/2000, 2004/5 - at the height of the Iraq war - and 2006/7. Asked at prime minister's questions on Wednesday if he would correct the record, Mr Brown said: "Yes. I am already writing to Sir John Chilcot about this issue." He said defence spending had risen from £21bn in 1997 to around £40bn this year and "grows every year in cash terms". But he said: "Because of operational fluctuations in the way the money is spent, expenditure has risen in cash terms every year. In real terms it is 12% higher, but I do accept that in one or two years defence expenditure did not rise in real terms." 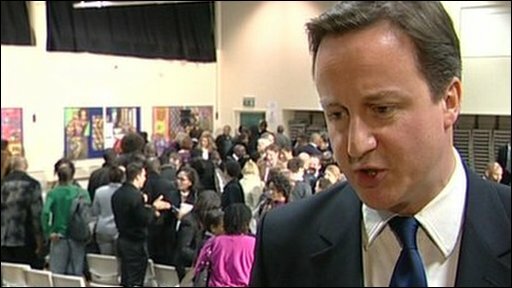 Mr Cameron told MPs it was the first time in three years he had heard Mr Brown "make a correction or a retraction". Speaking to the BBC later, he said: "He can't hide from the facts which is, whether you look at the budget, whether you look at the expenditure, whether you do it on a cash basis, whether you do it on a resource accounting basis, the budget was cut. "The money went down. And much more important than the process, and actually more important than the fact he misled the inquiry and Parliament, the most important thing is the fact that while our troops were at war, the defence budget was being cut. That's wrong." Shadow defence secretary Liam Fox said Mr Brown should be called back to the Iraq inquiry. Liberal Democrat defence spokesman Nick Harvey said: "He should apologise for the fact that under his watch our troops have not had the equipment they need to do the job." Mr Brown's spokesman said the prime minister had "taken the first opportunity" to tell MPs about his mistake but would not say when he first became aware of it. Asked how Mr Brown had made the mistake, Downing Street said budgets were "pretty complex" and defence was one of the biggest. "One has to accept that the broad direction and the increase in defence spending has been absolutely clear and significant over the last 13 years," a spokesman said.